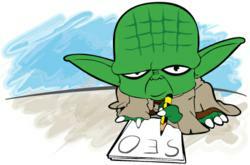 SEO.com has scheduled a series of free webinars to celebrate Talk Like Yoda Day in May. If you don't rank on the first page of the search engines then you don’t exist in the digital world. ... Users rarely click on second and third page results, so being on the first page is critical. To celebrate Talk Like Yoda Day in May, SEO.com will host a two-part webinar series entitled, “Implement These 10 SEO Tips, You Must.” Search engine optimization experts will recognize the lovably wise Star Wars character by presenting strategies for achieving higher website rankings in the search engines. Part one is scheduled May 10 and part two on May 17. The webinars will focus on content and link-building strategies to help companies gain more visibility in search engine results. The webinar on May 10 is scheduled at 1 p.m. Eastern time. It will focus on five content strategy essentials that help set companies apart and provide a competitive edge in the search results. Van Dyke will present. Having strong links back to the website is another important technique that helps improve search engine rankings for businesses. In the May 17 webinar, SEO Manager Kristy Ng will present five link-building strategies for generating better search rankings and more website traffic. Both webinars are free. To register visit http://www.seo.com/webinars/implement-10-seo-tips-you-must/. Search engine optimization is one of the most effective ways to market websites, according to Forbes magazine. “Simply trying to optimize your site will not work. You must fully commit to utilizing content and link-building strategies. In these webinars we will teach you the essentials for driving unique visitors to your site and ultimately increasing your search engine rankings," she said. SEO.com is a search engine optimization company that delivers a big return on investment for its clients by driving traffic to their websites through search engine optimization, social media marketing and affordable small business SEO services. Clients range from small startups to Fortune 100 companies. For more information visit http://www.seo.com/.